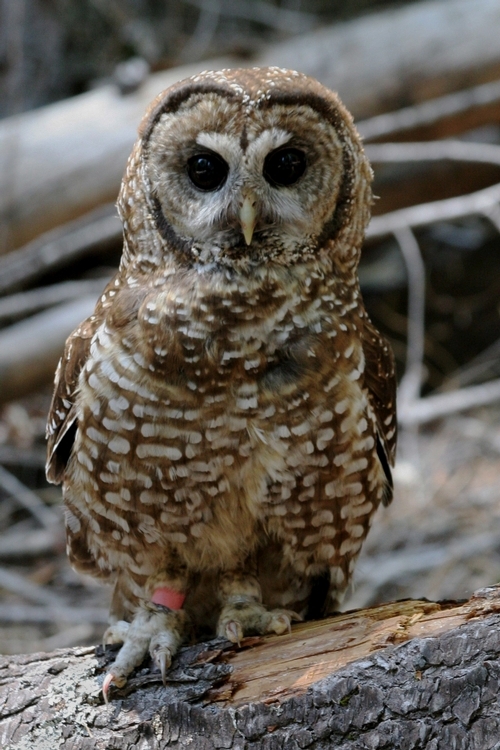 Do California spotted owls prefer to nest near forest edges? SNAMP scientists say no. 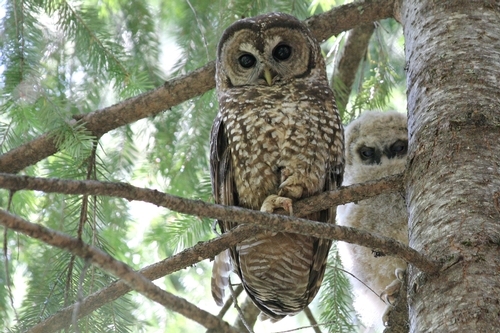 During a Sierra Nevada Adaptive Management Project (SNAMP) public meeting, a participant brought up the idea that California spotted owls preferred to nest near forest edges to be closer to foraging habitat and their prey. Principal investigator for the SNAMP Owl Team, Dr. Rocky Gutierrez, charged research fellow Casey Phillips and SNAMP Owl Team project leader Doug Tempel to research this question at SNAMP study sites in the Tahoe and Eldorado National Forests to see if this was true. Owl researchers used field data that consisted of current vegetation maps derived from aerial photos and owl nest site location data gathered during their annual surveys. One nest tree site within a forest stand was randomly selected from each owl territory and one comparison location within those stands was randomly selected by a computer program. The distances between these two locations, relative to the nearest edge of the forest stand, were then compared statistically. A forest edge could be either a hard edge, such as an adjacent clear-cut; or a soft edge, such as a young, mixed-conifer forest. Elevation at each nest site was also considered because owls living at higher elevations prey on flying squirrels that typically inhabit forests with greater canopy cover. So, one might expect owl nest sites to be further from forest edges at higher elevations. Researchers found no evidence that owls chose nest sites closer to forest edges than one would expect by chance, even though an edge location might bring them closer to a prey source. Results also showed that owls nested further from hard edges than expected. These results were consistent regardless of the elevation at a nest site. It is possible that some timber harvest may have occurred after owls used a particular nest site, and before the vegetation maps were made. This scenario would have only lessened the distance to the nearest edge at these sites. This would also apply to the randomly selected points. Therefore, habitat alteration should not have affected the findings. Researchers speculate that limited availability of suitable nest trees within the stand may be as important of a determinant in the location of a nest site as any physical characteristics associated with its location. Where owls choose to nest has implications for forest managers and their management plans. This research suggests that creating forest edges would not enhance owl nest site choices and that other factors would likely influence owl nest site selection, such as the availability of large trees appropriate for nesting (i.e., those with cavities, broken tops, and mistletoe broom). Information for this article comes from the following: Phillips, C.E., D.J. Tempel, and R.J. Gutierrez. 2010. Do California spotted owls select nest trees close to forest edges? Journal of Raptor Research 44:311-314.